When Howard Schultz developed Starbucks his idea was to create that "third place": not your home and not your office, but a different place where you can spend time reading, working, writing, daydreaming, all while enjoying a cup of coffee and something to snack on. In Spain, the concept of this "third place" doesn't really exist. Indeed there are coffee shops, restaurants and tapas bars (where you typically stand to eat and drink), but the environment of those places are the same as they are anywhere else in the world. You eat and drink, you may stay around and read a few pages from your book, but it's different. There's a key element missing in these places, a certain je ne sais quoi that is found at The Place located in the heart of Madrid. 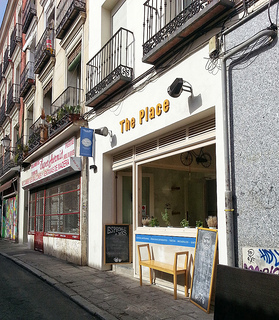 Owner Eduardo Noviciado recently opened the trendy sandwich bar just a few blocks North of the tourist area along Gran Via. While it's doubtful that Eduardo's plans are to conquer the world Starbucks-style, he has certainly succeeded in creating a unique environment where one can sit and enjoy some exceptional food and drink. 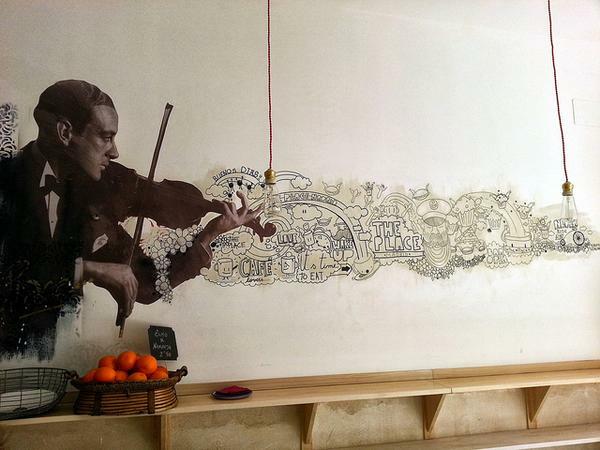 With clever illustrations painted on the walls (some in fun and unexpected locations) it's a place that's as stimulating to your eyes as it is to your palate. There's even an anyone-can-use computer and piano, a cozy fireplace for chilly nights, and a place inside to safely park your bike. Eduardo's passion for good-tasting, high-quality ingredients is evident in his creative menu. He strives to source unique ingredients and create interesting combinations of flavors and cuisines that are not typically found elsewhere. Incorporating the flavors of different cultures into his dishes - like Russian herring or a vegetable marmalade - sets him apart from the norm. It's this passion for good food that makes The Place a food-lovers mini mecca. Like a typical tapas bar there's an assortment of raciones, portion-sized appetizers ranging from Iberico jamón de bellota (Iberian ham), the best and most expensive cured ham in the world, to artisan cheeses. We started with the tostas, little open-faced toasted sandwiches. The Summum Hummus Parfait (above left), was a delicious sandwich of housemade chicken liver pâté topped with a bright and beautiful spread of carrot and red pepper marmalade. The natural sweetness of the vegetable marmalade was a delightful counterbalance to the decadent richness of the savory pâté. Along with the Summum Hummus Parfait was the Cyberiada (above right). 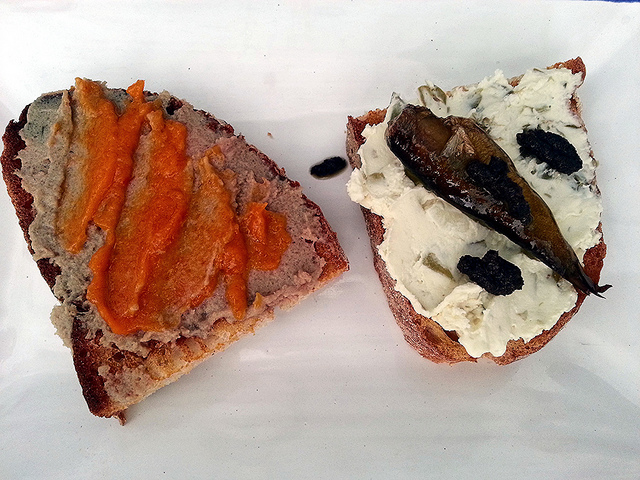 This sandwich was blanketed with an artisan cream cheese dotted with sweet pickles and topped with Russian herring and olive tapenade. 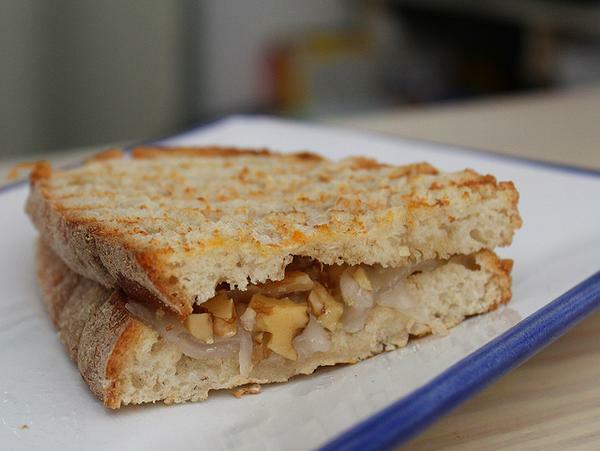 The house specialty bocadillo (sandwich) is the Diamante Ibérico, a delectable toasted sandwich of Iberico lardo (the sought-after thinly sliced fatty part of the ham) with walnuts, almonds and the perfect drizzle of honey. This is not your run-of-the-mill chorizo sandwich. Eduardo sources the artisan sausage from a small village in Soria, a walled city located in north-central Spain. It's served between toasted tomato-rubbed bread with a creamy melted artisan cheese that melds the flavors of each delicious ingredient. 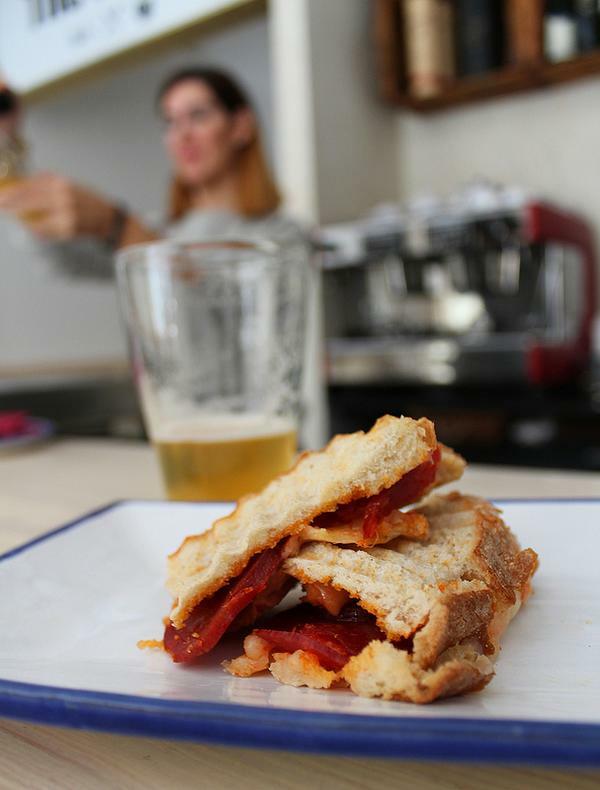 Smoky and mildly spicy, this chorizo sandwich was an unctuous taste of heaven in every bite. For one's imbibing pleasure you'll find a variety of thoughtfully selected libations from fine wines and Champagne to Toledo craft beers and house blended teas like the té de verano, a lightly sweet and refreshing citrus and yerba mate-based herbal tea. Try one of their natural juice blends like orange and ginger or head straight for their impressive selection of spirits. You can even get a bottle of wine or Champagne (among other delicacies) to go. Coffee aficionados will love the Italian coffee Eduardo imports from Florence and brews to perfection. 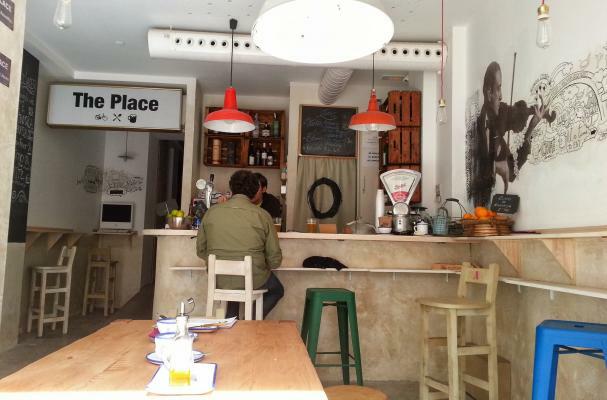 In fact, The Place is the only place you'll find this coffee in Spain. 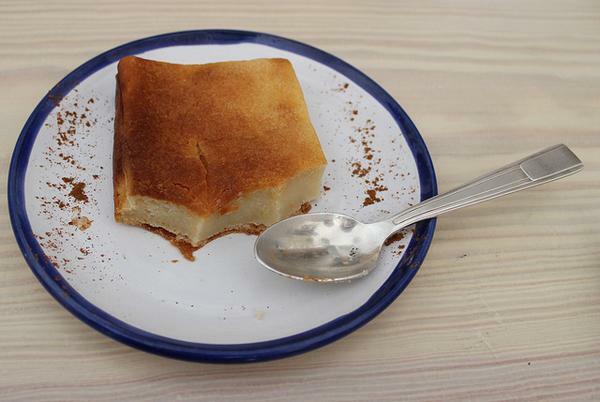 Dessert was a house made quesada, a dense and creamy cheesecake-like sweet that's similar to a ricotta pie. This not overly sweet treat with its light notes of vanilla was the perfect ending to a great meal. 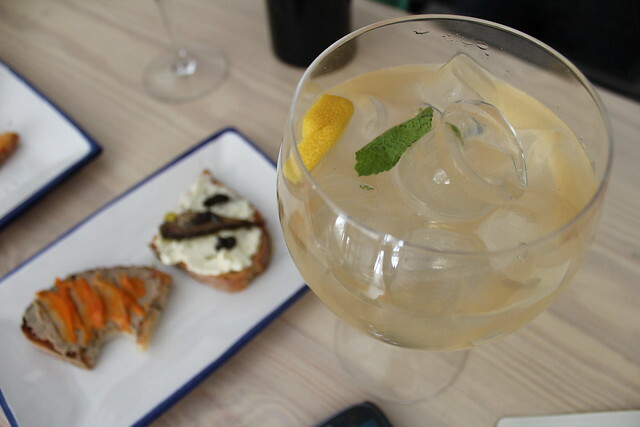 If you find yourself in Madrid, be sure to stop by The Place, have a nice glass of Tinto Roble Ribera del Duero and a selection of their amazing eats. Maybe even play a few keys on the piano in the back. You're sure to love this Spanish third place as much as we did.